In today’s modern age of paranormal investigation, an exponentially increasing number of “ghost hunting” groups and individuals are surfacing due to explosive interest created by popular paranormal-themed television shows and movies. The availability of the Internet allows anyone with a camera and a web presence to present themselves as a credible paranormal investigator willing to assist. But are they? Many reasons drive individuals to enter the field, some not altogether altruistic or noble. There are valid reasons such as scientific research and the genuine desire to help others, but other reasons can include self-validation, thrill seeking, desire for notoriety, and profiteering. I personally entered the field of paranormal investigation to help others in need but I’m also passionately interested in the historical and scientific research involved. Having had personal encounters since childhood, I had no need for self-validation of the existence of the paranormal and my past had provided enough thrills. If an individual or group is currently in the field or contemplating entrance, it is a good idea to seriously assess the reasons for doing so. The sober assessment of your reasons, motives, and intent is the first step in becoming a productive member of the paranormal community. It is not my place to negatively judge others but I am concerned that a lack of consistency exists in the field regarding proper protocols and conduct in dealing with investigative casework. An important point to address concerning casework is the area of client assistance or a “client-based situation” as I call it. I believe many investigative groups push such assistance aside carelessly or, at the very least, do not make it a priority. When dealing personally with a client who is seeking help with what they, their family or their friends may be experiencing, a number of considerations must be taken into account and it must be recognized the client has specific needs to be addressed. Client needs vary, but one of the first things to be accomplished in any client-based situation is to have a discussion identifying what the client should expect from you concerning their unique circumstances. Fully advise them of your process, protocols and also state your expectations of their role in the process. Ensure that you both mutually reach an agreement concerning confidentiality, imposed limitations or restrictions, a defined resolution, and any other issues that arise. You should also make sure this agreement contains both “realistic” and “achievable” goals that ideally lead to closure for the affected. Honesty is the best virtue. Never mislead the client or agree to help with their situation if you do not have the resources or ability to do so. Never make false promises such as a guarantee that alleged paranormal activity can be fully eliminated or even mitigated. Making empty or unfulfilled promises can lead to further emotional distress on part of the client, damages your credibility, and can reflect negatively on the entire paranormal community. Some clients may just be seeking validation of potential paranormal activity or looking for an explainable cause of what they are experiencing. As simple as it seems, this is a very important request from a client and may have a positive effect on their psychological state. Providing either resolution can bring a peace of mind to a client who may be in distress or even questioning their own sanity. Help is offered through sound investigative techniques, logical reasoning, and the adherence to proper protocols that address issues such as the need for privacy and other concerns. Some clients may be seeking total elimination of activity out of fear or disruption of daily living. It is important to note that, in my experience, total elimination of paranormal activity is not a simple task and, in many cases, may not be achievable. This is why it is very important not to make any unconditional promises with respect to the services that you provide. At the extreme end of the paranormal spectrum, the client may be experiencing negative activity that is affecting their health and livelihood. Examples of this may be what some term “demonic” or “evil”. The definition of “extreme” can however be any activity that creates a profoundly negative experience for the client. This type of situation is a most delicate one requiring careful planning and strategy with the intent of providing successful closure or resolution. It cannot be stressed enough that an individual or team must never rush into extreme situations without first acquiring necessary research and resources to complete the job. Paranormal Task Force, the team which I belong to, utilizes what we consider a “client-centered” strategy or approach that results in individualized client “empowerment” through proper guidance and alignment of resources. When accepting cases, it is important to realize that an investigative unit may provide a kind of “first responder” social service to the client. In many cases, a client may call you or your team for assistance before contacting medical practitioners, clergy or other professional sources. As such, the investigative unit is assuming a lot of responsibility and this is a huge task not to be taken lightly. If mishandled, it can bring danger to all parties involved. In any investigation, there is no room for the unprofessional or unprepared and this is especially so in extreme cases. The need for careful assessment and the desire and ability to help the client while adhering to very strict protocols and conduct is always of utmost importance. As a paranormal investigator, it may be good practice to approach client-based situations in a manner that emulates the methodical techniques of law enforcement. It is imperative to have good interpersonal skills, patience, logical reasoning, and the ability to remain objective at all times. Prior to any investigation, facts have to be gathered through research, questionnaires and interviews. The purported location of events must be inspected for environmental conditions, possible explainable causes, and to ensure the safety of others. All of the collected information must be logically analyzed and assessed before any assistance or investigation can occur. The questionnaires and interviews that must be completed should extensively log the client’s important information relevant to the case. In addition to questions concerning activity, history, and events, important client data should be collected such as mental and health status, faith or belief system, family history, domestic issues and other factors influencing the individual, their family, and others around them. It is important to remember that client’s issues may not necessarily be caused by something paranormal or unexplainable. Having both internal and external resources with experience in sociological, psychological and medical backgrounds is a must to assist in the proper analysis of these situations. In many cases, the client may need psychological and/or faith and belief based reinforcement. Reinforcing a positive psychological and/or faith and belief system helps the individual to better help themselves and their family. This is part of the “alignment” of resources sought for the client and others affected. It is very important to align the client with resources that accommodate the client’s faith or belief system. You would not want to provide a Wiccan client with help from a fundamental Christian or a Catholic client with help from an Islamic Priest unless it was a last resort or emergent effort and the client was fully open to this without hesitation. In instances where the situation is perceived to be extreme or has a greatly negative impact on the client and others, a professional faith practitioner with proper credentials should be employed to assist the client in need. It is imprudent to simply follow a self-prescribed procedure like burning sage or tossing around holy water in attempt to resolve an extreme issue. Many times, this can make a bad situation even worse if paranormally malevolent activity is indeed involved. However, as with anything, there are exceptions. If extenuating circumstances exist, a lay person who is devout in their belief may assist with some prayers or blessings if that belief is aligned to that of the client and is allowed by the hierarchy of the client’s practiced faith. If the situation is handled properly, closure may come in a few weeks, or a few months, but it must be noted that, in more difficult cases, closure may never fully be realized. Many times, no matter what assistance you may provide, closure only comes to those that are willing to help themselves. The old cliché about “leading a horse to water but can’t make it drink” unfortunately applies in some cases. As long as you maintain a positive attitude, practice proper protocols and conduct, utilize all resources to their maximum and do the best you can, you have handled the client-based situation properly. There is a bona fide need for valid research and equipment to document events during an investigation. To obtain assistance from a credible faith practitioner during rare or extreme situations, it may be required to provide proper documentation of events or possibly even captured evidence. Do not let anyone convince you that a proper investigation can be conducted without research and equipment. It can’t! Another very important part of this process is to institute a client support system that provides follow-ups or consultations to the client at regular intervals. This helps to keep the client on a positive track towards the closure they may be seeking. In some cases, a client may be “yours” for a lifetime and you have to be willing to work with them long-term or until full closure is brought to their situation. 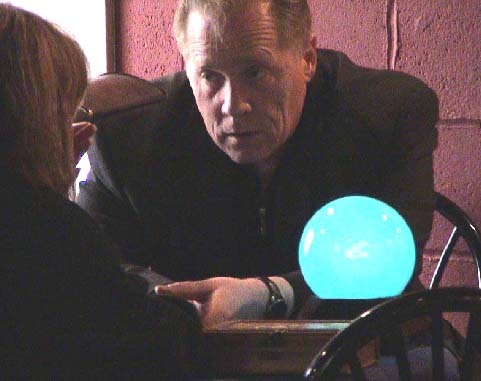 Proper client assistance is one of the key issues of paranormal investigation. A thorough, well-prepared individual or team following proper protocols and addressing client needs in a professional, caring and respectful manner may be of great help to those who may be affected by paranormal issues.